If you're wondering how to get clients (and keep them) for you VA business, say hello to content marketing. I went to a content marketing hackathon this past Sunday here in Israel. It was hosted by the notorious Neil Patel. For those of you that don’t know what content marketing is, you’re not alone. Most virtual assistants don’t know much about marketing, in general, let alone content marketing. There were about 200 people in the audience. Most of them were startups and from those startups there were CEOs, VP of Marketing and other members of their executive teams. Then there was me and my good friend Sarah Noked. Sarah is an online business manager/VA like me. I kept looking around for other VAs but didn't find any. Why was it that out of roughly 200 people there were only 2 virtual assistants in the crowd? Because most virtual assistants haven’t got a clue about marketing, let alone content marketing. And what’s worse is they don’t recognize the importance of attending events about marketing. Going into business for yourself is no joke. You’ve got to learn a ton if you want to be successful. Knowing how to market yourself is the difference between making it or not. I’m not suggesting you skip past the business basics and go straight to marketing. No, you’ve got to do things right. Step-by-step. You’ve got know how to set the foundations for your virtual assistant business. That means, coming up with a list of your core services, figuring out who the heck you want to work with (hint, it’s not EVERY small business owner) and then figuring out what you’re going to charge. After you have all that figured out, you need to choose a name for your virtual assistant business, create a website, write the copy, create your social media profiles and finally, figure out how to blog and actually commit to blogging so you can drive traffic back to your website. I grew my virtual assistant business back in 2010 from one client to 10 using LinkedIn’s internal blogging platform. I didn’t have a website. I just blogged (and networked my pants off) on LinkedIn. Don’t get me wrong, I hired a website designer but the site he created sucked. It was a train wreck and I was embarrassed by it. I didn’t let the lack of a website stop me from marketing myself. On the contrary, I used what I had to get in front of potential clients. And when you don’t have a website, your LinkedIn profile is an excellent stand-in. Moral of the story, content marketing works. It built my business and it will build yours too. Let’s go back to content marketing. I want this post to give you some value, not just information. I want to teach you some ways you can start implementing a content marketing strategy for your virtual assistant business. But before I do, let me explain what content marketing is. Gary Dek wrote a great post over at TwelveSkip and I liked how he defined content marketing. “At the very core, content marketing is getting the attention of your targeted audience without the intention of outright selling. Want to know the 35 best sites to help get your posts found online? Sign up below to get immediate access to the list. 1. Start blogging on a consistent basis. Even if it’s only one blog post a month. Commit to a schedule. My friends over at First Site Guide wrote a great post on how to start a blog and you'll want to check it out. 2. Create a case study. There is nothing better than reading the opinion of a customer as it relates to the services your business provides. HubSpot has a great post on how to create compelling case studies. Email is a powerful marketing tool. If you have access to your prospects inbox, you have the potential to turn them into clients. Once someone signs up to your email list create a series of emails full of information and value they can put to use right away. Mix in some promotional content along the way. I’d send out 3 value packed emails that help them in a practical way and then the 4th email could be a promotional email that sells your services or a specific offer. Or perhaps you can just ask them to sign up for a free 20-minute exploratory call. This is a powerful way to get all eyes on you. Interview a guest expert that has a solid social media following and have them share the post with their followers. The interview should provide immediate value to your readers. For example, interview a Facebook Ads expert and have him teach your audience how to run an ad with the power editor. Or interview a Pinterest expert to show you how to leverage Pinterest to make more sales. You get the point. 6. Create a how-to blog post. I’ve created how-to posts on subjects like Pinterest Marketing for Virtual Assistants and How To Use Gmail Filters. Think about something you know well and teach it by writing a how-to post. Don’t assume you have nothing of value to teach. We all know something that someone else doesn’t. In that vein, we are all teachers. 7. Create a pinboard on Pinterest. My friend Anna Zubarev has got Pinterest down to a science. Check out how she curates content in her Pinterest Boards. Everything is clearly defined and I would wager that Pinterest drives a lot of traffic back to her site. 8. Write a list post. List posts are super effective. You could list out 10 of your favorite companies and why you love them or a list about some of your favorite business books. Or you could write a post about social media bloggers and why you follow them. I’d recommend if you’re just starting out to include up and coming bloggers to add to your list so you can build relationships with them. Make sure you email each and every one of them letting them know about your post. They will be flattered you included them and may even share the post to their followers. 9. Create a resource page. Resource pages are an excellent way to show off the resources you use to run your business and your client’s business. Add to it over time and make sure to let people know they are on your list for fabulous resources. You could even offer this resource list as a freebie download (just a thought). Content marketing can get you in front of your prospects and help you build and grow your business. The sooner you start implementing just a few of the tips above, the faster you'll see results. The key is to be consistent and commit yourself to making your business a priority. 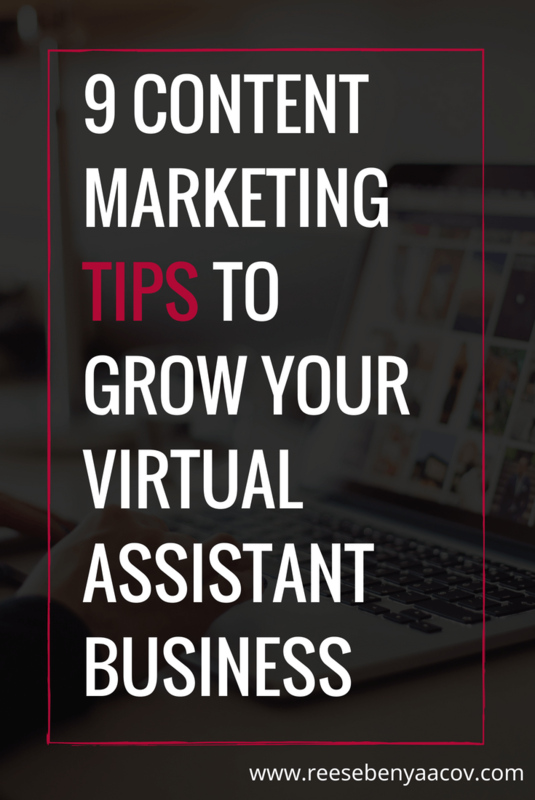 Have you been using content marketing in your virtual assistant business? What are you doing that's working? What are you doing that isn't working? Let me know in the comments below. I read every single one.